The puck dropped Wednesday night to kick off the 2018-19 National Hockey League season, and it did so with 70 alumni of the World Junior A Challenge earning spots on rosters across the league. The United States led the way with 19 alumni in the NHL, followed by Russia (12), Canada West (12), Canada East (11), Sweden (eight), the Czech Republic (five), Denmark (two) and Switzerland (one). 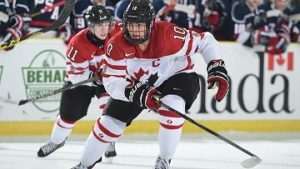 The Canada West and United States contingents both included players who won gold at the World Junior A Challenge; 25 players in all – eight Canadians and 17 Americans – stood atop the podium, with U.S. forwards Craig Smith (2007 and 2008) and Kyle Connor (2013 and 2014) to only players to hoist the trophy twice. The list of alumni also included eight players who earned MVP honours – Kyle Turris (2006), Scott Mayfield (2010), Devin Shore (2011), Vinnie Hinostroza (2012), Nick Schmaltz (2013), Nikolaj Ehlers (2014), Tyson Jost (2015) and Andrei Svechnikov (2016) – and 14 WJAC all-stars. Twenty-eight of the NHL’s 31 teams had at least one alumnus on their 23-man roster, led by the Colorado Avalanche with five; Boston, Columbus, Detroit, the New York Rangers, Pittsburgh, St. Louis and Washington had four each. In addition to the 70 who cracked the rosters, five alumni started the season on the injured list with the respective teams, and may or may not join the NHL roster once they’re deemed healthy.